Grilled eggplant can be one of the great treats of summer: lusciously tender eggplant, with bits of crispy charred edges here and there. It works on its own, as part of a grilled vegetable platter, or even as a stand-in for a meat patty in burgers. Sadly, it is more commonly either overcooked and flavorless or undercooked and spongy. Luckily, there is a way to grill tender, flavorful eggplant every time. This easy recipe uses the power of salt water (a.k.a. brining) to guarantee great grilled eggplant—crispy brown on the outside, creamy sweet on the inside, and full of flavor—every time you pop a few slices of this brilliantly flexible vegetable on a hot grill. Feel free to embellish with spices and other flavors, including serving with a drizzle of balsamic vinegar, a dollop of pesto, a spoonful of romesco, or a scattering of crumbled feta cheese and make this simple technique a recipe of your own. Grilled eggplant is also particularly yummy with a few grilled tomatoes at its side. In a large bowl, dissolve the 2 tablespoons of salt in 1 cup warm water; stir until the salt is fully dissolved. Add 6 to 8 cups cold water. Set aside (this is the brine). Cut off and discard the stem end of the eggplant. 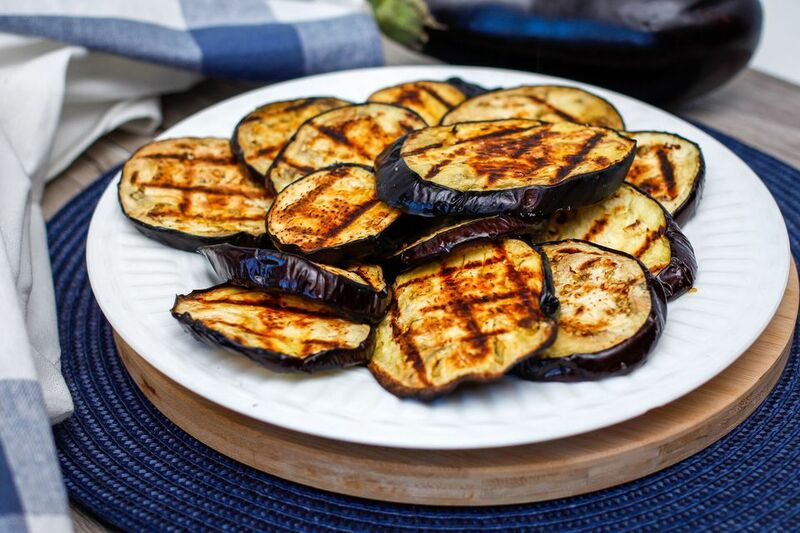 While some people find eggplant skin difficult to digest, leaving the skin on for grilling helps the eggplant slices keep their shape on the grill and makes them easier to handle (note: diners don't need to eat the skin). Cut the eggplant into 3/4-inch thick diagonal, crosswise, or lengthwise slices. Put the slices in the salt water. Weigh them down with an upside-down plate, and let soak for at least 30 minutes and up to an hour. Meanwhile, heat a charcoal or gas grill to medium-high heat. You should be able to hold your hand about an inch above the cooking grate for 3 to 4 seconds before pulling it away from the heat. Drain the eggplant and pat it dry with paper towels or a clean kitchen towel. Lay the slices on a large baking sheet or tray. Brush one side with olive oil and sprinkle with salt. Lay the slices oiled-side-down on the grill. Close the lid if using a gas grill and cook until grill marks appear, about 5 minutes. Brush the top sides of the slices with oil and sprinkle them with salt. Turn the slices over, close the lid on a gas grill and cook until grill marks appear on the other side and the eggplant is very tender about 5 more minutes. Brining your eggplant will result in a crispy brown outside, creamy sweet inside, and a more flavorful dish.